The US mainstream media, who pulled out all their guns in the past week to accuse POTUS of spreading a ‘White Nationalist Conspiracy Theory’, seem to forget that there is no expiration date on the internet. 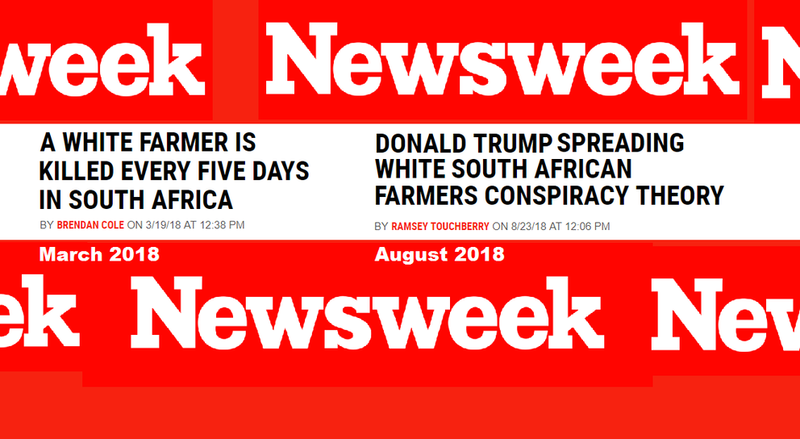 Whereas we already informed you over the weekend that Vox had no problem telling its readers that it whether the South Africa story was ‘true or not is irrelevant’, this time it is Newsweek who were caught in the act of creating some ‘Fake News’. Related coverage: <a href="http://thegoldwater.com/news/35160-Vox-On-Trump-s-South-Africa-Tweet-Whether-Or-Not-It-s-Actually-True-Is-Irrelevant"> Vox On Trump’s South Africa Tweet: “Whether Or Not It’s Actually True Is Irrelevant”</a>. - Gabriel Stols, 35, told the Independent how his younger brother Kyle, 21, was shot dead by four people on a game reserve near Bloemfontein. “What is happening to us is torture, it is the slaughter, it is brutal, it is revenge. The world doesn’t know what is happening in South Africa,” he said. - Hannetjie Ludik, 56, from Pretoria, told the paper that three armed men broke into her family’s house, stole money and raped her. - … there have been 109 recorded attacks so far in 2018 and 15 farm murders, meaning that this year, one white farmer has been killed every five days. Liberals don't understand Black Africans are practicing a style of Nazi Genocide Confiscation of property and Relocation. This African government foundation is SWAPO, formerly the South West African People's Organization (socialist party). Remember, the liberals and their media are the ones pushing National Socialism on a Global scale. BTW: for you Liberals that never studied National Socialism. Kinda ironic that the Liberal Strom Troopers called Anti-FA, which claims to protest Fascism is an arm of the Liberal Socialist party and more in line with Hitlers Brown Shirts (SD') practices.